Rare open back designed table lamp for near wall installation from Romeo Rega. 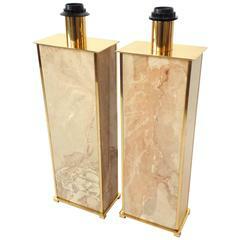 The base is made of thick solid lacquered brass with enameled black brass horizontal insert. One regular E26 size socket rated at 100 watts maximum. Switch on cord. Original shade frame with new fabric. Come with order. One brass frame is more oxydized ( darker ) than the other one . Bronze discs that open up like clamshells for storage and fold back in to become side tables. Sleek cubes barely suspended off the ground that transform into full-size dining tables. Clean-lined boxes that contain multilevel shelving. Looking at the work of Italian designer Gabriella Crespi, born in 1922 and still producing furniture in her Milan studio, it’s hard to believe that many of these highly functional pieces — modernist Rubik’s Cubes of materials, colors and ergonomics — were created decades ago. Among her best-known creations, the bronze Ellisse table, 1976, and her bronze-and-lacquer Yang-Yin bar, 1979, encapsulate a designer who had a strong dualism in her vision, mixing humble and precious materials, for instance, or creating geometric shapes that were softened by sensual surfaces. Crespi began studying architecture in 1944 at the Politecnico, in Milan, where she was among just a handful of women, and became profoundly influenced by the work of Le Corbusier and Frank Lloyd Wright. After getting married and having children, she launched her own collections, from jewelry to furniture, and soon gained a loyal following, with design houses such as Maison Dior snapping pieces up for their own lines. 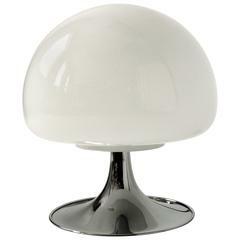 Rare Romeo Rega table lamp manufactured in the 1970s. 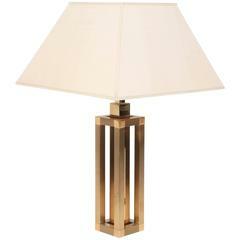 Geometrical stem made of brass, dull and polished parts, original raw silk shade. 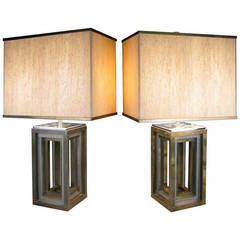 Table lamp signed by Romeo Rega with laquered coffee color body standing on brass base and finishing's Measures: 47 x 23 cm. 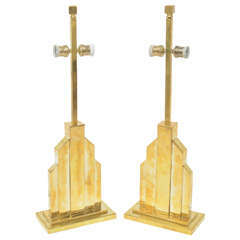 Pair of Rome Rega (Signed) table lamps in brass. Rewired. Beautiful Italian lamp from the 1970s, made of brass and chrome by Romeo Rega.